Breastfeeding really can be stressful enough without baby going on a “nursing strike.” As a breastfeeding mom, you can often find yourself wondering if your baby is getting enough food to eat since you can’t measure what is going in. When a baby goes on a nursing strike (refuses to nurse), it definitely ups that stress level quite a bit. 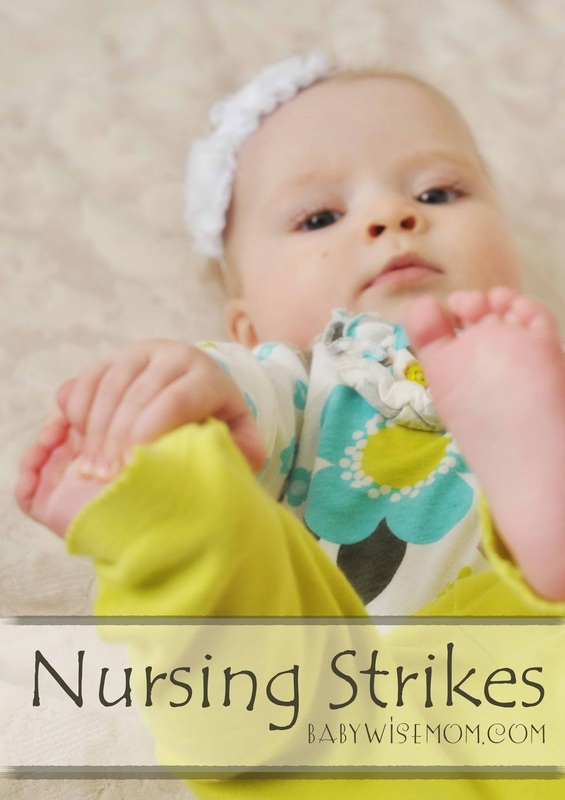 A nursing strike does not necessarily mean you have to stop nursing. You can often do things to work through it and continue forward with your breastfeeding experience. Teething: If your baby is teething, she might have such sore gums that she won’t be willing to breastfeed. If you suspect this is the case, look into teething remedies for teething. You might find that for a few days, you need to give some painkiller, wait 15-20 minutes, and then feed baby. Do not stress if that is the case. Remember to be flexible with your routine during sickness and pain. Wonder Week: There are certain Wonder Weeks when your baby just will nurse much less. I have found this to be true especially around week 12-13. It might be that your baby is in a developmental milestone week and just not eating. Sickness: A stuffy nose makes it hard for baby to breathe. Sickness can also lower appetite, leaving baby just not interested in eating much. Another possible sickness is thrush, which can cause pain in baby’s mouth. Distraction: Right around four months old, a baby will start to get very easily distracted while nursing. Your baby will start to be more interested in playing and even just looking around the room than eating. This wouldn’t be a true nursing strike, but it feels close and it can be very frustrating. Distraction can also come as your baby gets older and wants to play more than eat. This is especially true when your baby is working on mastering a skill like crawling or walking. Baby wants to practice the skill and not be stuck eating. Slow Letdown: In the early days, your letdown would often cause baby to choke because it was coming so fast. As your body regulates, the letdown will come at an easier pace. If your letdown gets too slow, your baby will get frustrate and might even decide it isn’t worth the effort. Lowered Milk Supply: If you are stressed, not getting enough rest, not drinking enough water, or even not eating enough calories, you can have a lowered milk supply. This can frustrate baby enough that baby won’t bother working too hard at it. Overly tired: If your baby isn’t sleeping enough, it can feel like a hunger strike when it is really just a sleepover in your arms. Something You Ate: The flavors you eat can be passed through your breastmilk. For the most part, you can eat what you want and baby will just get used to it, but some things can be upsetting to baby’s tummy and some flavors might take some getting used to. If you are on a medication, baby might dislike the flavor enough to say, “thanks but no thanks.” See Fussy Newborns and Mom’s Diet for more on this. Also, along the lines of tastes, you could potentially have changed soap or lotion and baby doesn’t like the smell or flavor. Faster Eater: What may feel like a nursing strike could really just be your baby being a very fast eater. Kaitlyn, my second child, got to be a very fast nurser. She would nurse in just a few minutes on each side. She was also a baby with rolls, so I knew she was getting enough to eat by looking at her and knowing her pee/poop patterns. If she had been a thinner baby, it would have stressed me out because I wouldn’t have had that obvious visual to tell me everything was okay. Some babies just eat fast. Kaitlyn still can drink very quickly to this day. Fear: If your baby recently bit you and you reacted strongly, it can be making your baby nervous. Now, it happens! Don’t feel guilty. When my fourth child bit me, I reacted very strongly. I wasn’t expecting it and it hurt. So this isn’t a moment for you to feel guilty. Just wait for your sweet, sensitive baby to feel up to nursing again. Ready for an Extended Schedule: This can happen when a baby is ready for a 4 hour schedule but still being fed on a 3 hour schedule. Baby just isn’t hungry so she doesn’t eat. Time to Wean: Sometimes a nursing strike happens because it is just time to wean. This would be for older babies–usually closer to 12 months or older. Trust Your Baby: A child is just not going to let herself starve. Trust that your baby will eat when she needs to eat. She might skip the feeding all together, but will be hungry at the next feeding. Relieve Discomfort in Baby: Give the painkiller, clear out the nose, change nursing positions, treat the thrush…do what you can to help baby be comfortable. Some nursing positions are better than others for a teething baby or for keeping the nose clear. Fix Routine: If baby needs a longer schedule, do it. If baby needs to get down for a nap sooner, make it happen. Fix the routine to allow for a baby ready to eat. Pump so your supply doesn’t drop: Get a pump and pump to keep your milk supply up. If you stick to the breastfeeding, your baby will want to eat again and you will want some milk t here for baby to eat. Go in a dark, quiet room: Go into a quiet room where baby can focus and not be distracted. You can try holding baby’s hand or letting baby play with a necklace–though a toy can definitely backfire. You might also need to let baby try that new skill of crawling out for 5-10 minutes before breastfeeding. Relax and let the letdown come: With my fourth baby, I would find if I was distracted and thinking of a million other things, my letdown wouldn’t even come when my baby was older. She would look at me and whimper in a heartbroken way and bring me back to the present. I would always try to start the nursing session off with relaxing and just imagining the letdown coming so my body would let it come and she could eat. Watch Growth and Diaper Output: If you are stressing out about baby getting to much, watch the things you can measure. You can measure diaper out put, growth, and contentedness. If those things are all on track, let go of the stress.